HBO is running an advertising campaign with the line, “Nobody loves you like HBO GO”. Four TV ads, appealing to men in their twenties, suggest that even one’s most cherished relationships, with one’s fiancee, dog, mom or grandma, are not able to compete with the endless hours of Boardwalk and Game of Thrones offered on HBO GO. 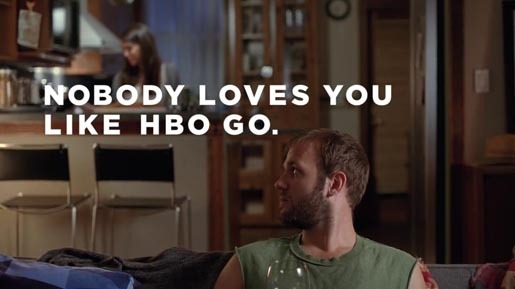 The Nobodoy Loves You Like HBO Go campaign was developed at BBDO New York by chief creative officer David Lubars, executive creative directors Greg Hahn, Mike Smith, associate creative director/art director Lawrence Melilli, associate creative director/copywriter Matthew Mulvey, executive producer Angelo Ferrugia, director of integrated production David Rolfe, business affairs manager Kathy Bannon, senior account director Tara DeVeaux, account lead Leland Candler and account manager Christina Liu. Filming was shot by director Aaron Stoller via Biscuit Filmworks with director of photography Peter Donahue, executive producers Shawn Lacy and Holly Vega, line producer Karen Wolfe. Editor was Geoff Hounsell at Arcade Edit. Animation was produced at Imaginary Forces. Telecine was produced at The Mill by colorist Fergus McCall and producer Orlaith Finucane.